What do you know??? We're going to the Superbowl! The town is buzzing with excitement. It's hard not to get swept away with the glory of it all. I have to confess, I'm not a huge NFL follower. Mr. C is...and therefore, I am by default. 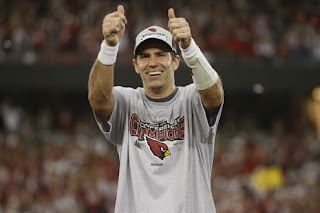 But I do know this much: Kurt Warner is not bad on the eyes...I mean if you have to watch the game and if anyone should go to the Superbowl...it should be a team with a hot quarterback. Right? This town had a one track mind this weekend. Everywhere we went...people had to ask, "are you watching the game Sunday?" From casual strangers in a restaurant to my pharmacist to the guys who replaced my microwave Saturday morning (it blew up...different story)...that's all anyone talked about! It really is exciting, though. And ironically, given the bleak state of the country right now...this game and this team brought a surge of electricity to the valley. Weird. Saturday night I had a date with Mr. C. We went to one of our favorite pizza places . This place is always packed. But, that night it was exceptionally packed. Luckily, we walked in the bar - right when two stools opened up. So, we were able to drink our Amstels and inhale a rather large pizza right there. As we began to talk to other patrons, we realized that not only was the BIG game happening the next day, but PF Changs Marathon was the next day as well. That's why it was sooo busy! A-ha! It was fun to be out on the town - with all of that excitement and energy flying around! 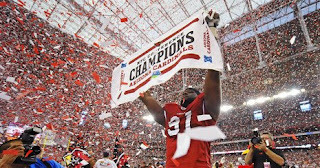 Tucson is full of excitment as well about the Cardnials going to the superbowl! And I totally agree about the hot quarterback...the 2nd string, Matt Leinart...yeah, he's very easy on the eyes as well! Hope your all doing well. I really look forward to the summer months, cause that is when we usually get to see all the Watson side of the family. Hope we get to see you at least once at the cabin!